No doubt about it, a pile of shaved ice combined with a ladle full of coconut milk and green mung bean flour 'pasta' is the best backdrop against which to show off gula Melaka's (Malaysian coconut palm sugar) seductive sweetness. And this is the second best: plump little sweet potato donuts. 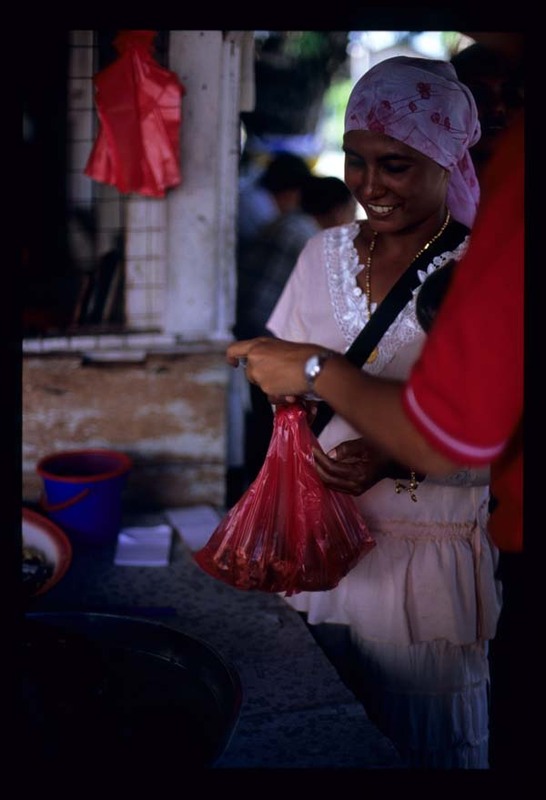 Kuih keria seem to be a Malacca specialty; there are several purveyors around town. 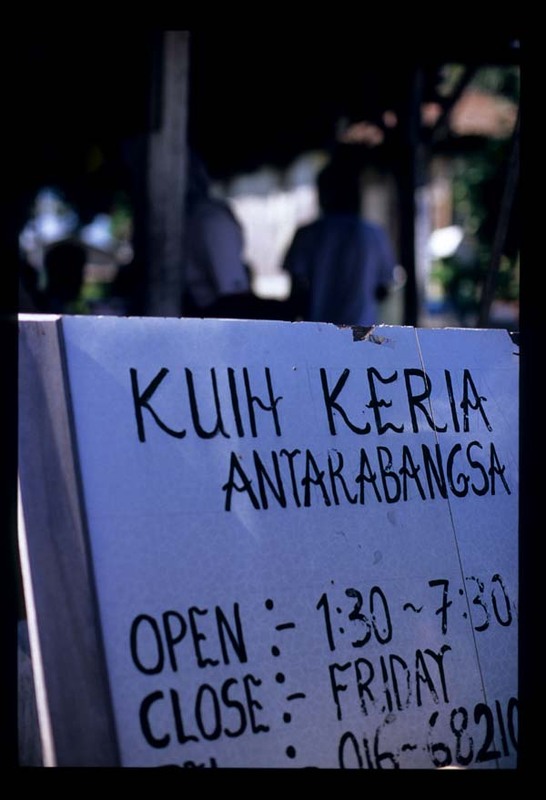 But word has it that Kuih Keria Antarabangsa, a roadside shack opposite the beach to the northwest of the historic center, is the best. This family has been in business for over ten years - the recipe is the proprietess' aunt's. The line snaking around the front of the shack is long, and so is the wait. Customers buy these sinful delights by the bag full. The sweet potato - mixed with flour - gives the donuts a slightly chewy texture. After being pulled from the fryer they're dropped in a bath of melted gula Melaka, and then pulled out wearing a thick, caramelized robe. Little to no sugar is added to the dough, and gula Melaka's sweetness is well-balanced by its lightly bitter and smoky notes. The result is a delectable sweet with substance that, unlike American-style donuts, is not cloyingly sugary. Gorgeous to look at, even better to eat. These kuih keria are wonderful warm but hold up well enough to enjoy the next morning. If they last that long. Krispy Kreme be damned. If this isn't the world's best donut, we don't know what is. Kuih Keria Antarabangsa, Jalan Tengkera (follow Jalan Tun Tan Cheng Lock till it turns into Jalan Tengkera - as if you're heading to the old trunk road to Kuala Lumpur - the stall is on your right). 130-730pm, closed Friday. Also selling goreng pisang (fried bananas) and kerepok (fish crackers). 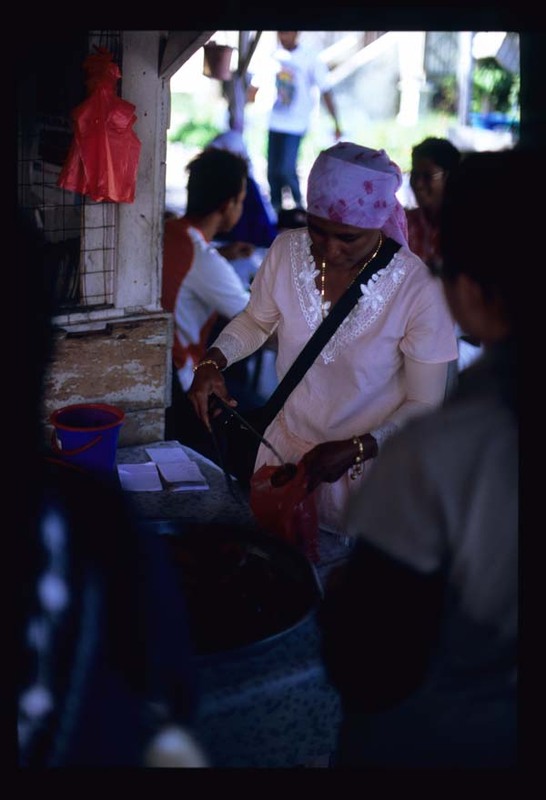 The kuih keria tend to sell out early on weekends. Wow, for a minute there I thought the picture of the "Kuah Keria" were chocolate cheerios!!! BTW, great articles and pics here - always! If only Krispy Kreme sold these donuts, I might start going back to them. 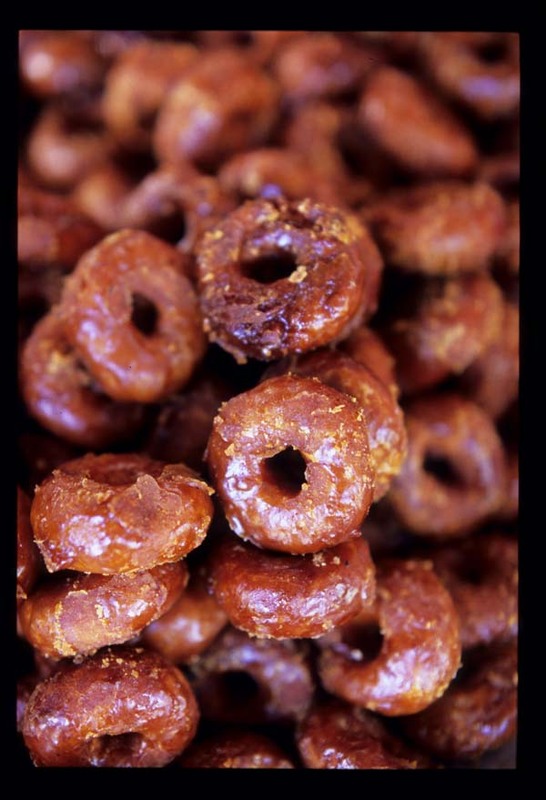 CK - if chocolate cheerios were coated with gula Melaka I'd probably eat them! Nate - these wouldn't be sweet enough for the American palate. Too bad- they don't know what they are missing! Those kuih keria looks mighty tasty. I love them to bits - but have only encountered those coated with white sugar (like a glazed doughnut), never with gula melaka. Yet. Had to say that I really love your site! Arrrghh..these were one of my absolute favourite foods in Malaysia - and even then I never got enough of it cos they were hard to find. I think I had them probably less than 5 times in my life..Then we moved to Australia. And now all I can do is devour your photos. BTW the hubby & friend are in KL for a week at end of August and we've been madly taking notes from your site to really savour the best that KL has to offer. So thanks for the pain-inducing photos (hurts so good) and great posts...I tell everybody who loves Asian food about EatingAsia!